Beyoncé was photographed with her twins, Rumi and Sir Carter in Miami over the weekend. 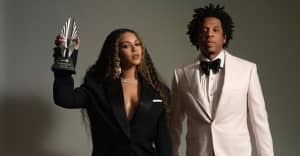 It's the first time the twins have been photographed in public since their iconic reveal, and they can be seen being held by both Beyoncé and Tina Knowles Lawson. Beyoncé's pregnancy was it's own cultural moment, starting when she posted her Palermo Spain reveal photo on Instagram to literally every moment after. Check out the photos of the Knowles Carter family above, and Twitter's reactions below.